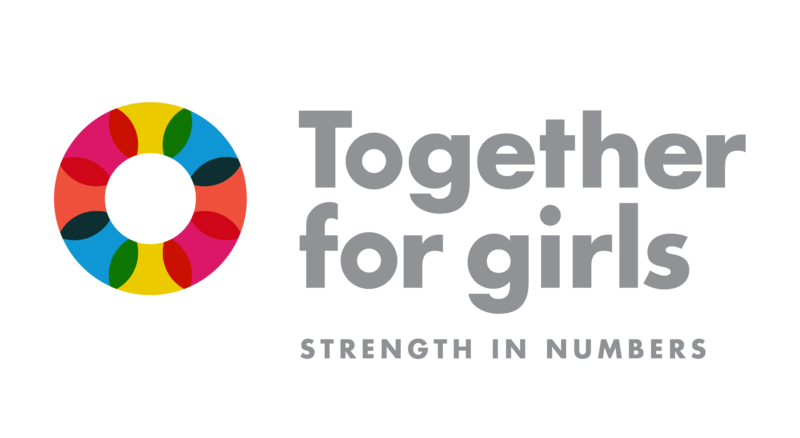 Girls around the world have something to say, and now it’s our turn to listen. Whether we’re discussing gender inequality, discrimination, or violence, it is clear that girls can provide critical insights, opinions, and nuanced perspectives on these issues, if we only provide them with a forum through which to express their voice. One particularly powerful way to do this is through artistic expression. For the second annual World in Your Hands Art Contest, Together for Girls and the Coalition for Adolescent Girls asked female artists ages 12-24 about their influences, how they themselves strive to influence others, and how they use their voice and influence to make the world a better place. Applicants from ten different countries around the world submitted creative and inspiring pieces in a variety of mediums ranging from poetry to painting. Featured below is the winning piece by Lauren, and each of the pieces by the runner-ups Shafiqah, Sophia, Jessica, and Aye Aye, as well as descriptions by each of the artists about their beautiful work. This year’s contest winners hail from Thailand, Myanmar, and the United States. 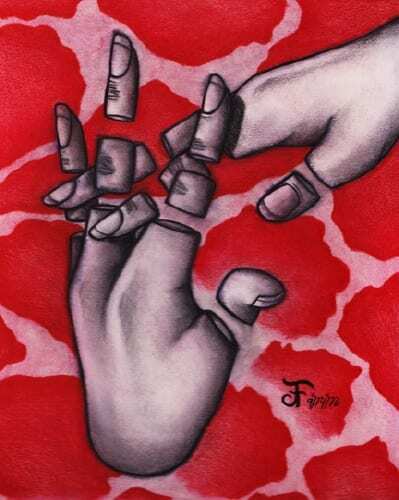 The winners of the World in Your Hands art contest will be featured this week at the Commission on the Status of Women (CSW), where Together for Girls is hosting an event highlighting how girls around the world are speaking out and taking action to break the cycle of violence. As each of the art contest winners’ powerfully demonstrates, many girls have poignant and important messages to share. Now it is up to us to ensure these messages are valued, heard, and amplified. My work of art is a graphite self-portrait that focuses on how past experiences and people have influenced the person that I am today. Each part of the piece has a symbolic meaning that creates the overarching theme that an individual cannot grow or exist without external influences, much like how trees receive nutrients, protection, and sustenance from its surroundings and interact with the life forms around them. 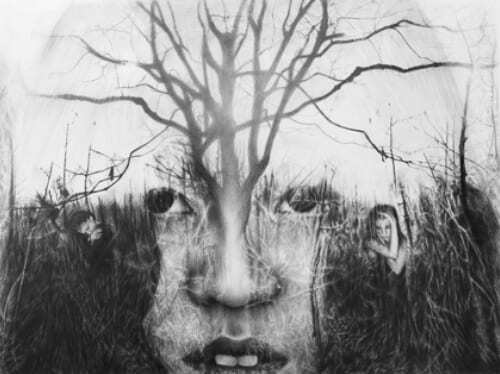 In general, individuals are not only contained within themselves but also exposed to the network of society. The entanglement of the roots in this work represents my interactions with others and also symbolizes that this network of influences has truly become my roots: they have constructed my core beliefs and values, behavior, and personality. 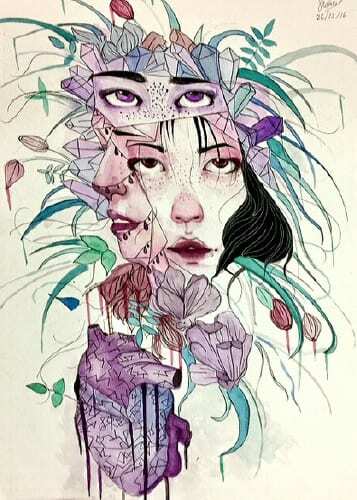 As these roots grow and extend into the tree branches that make up my face and continue to grow past my portrait, this represents how I hope to and am using my voice to advocate for what I believe in, such as fighting gender inequalities and discrimination. And so, in full circle, I believe that those who care about me – my family, friends, and teachers/advisors, as well as those who have brought me down and taught me to find strength in myself, have and continue to influence who I am, including my roots of morals. I have and will persist in using my voice to advocate against what I believe is wrong in society. My artwork is about how we as adolescent girls should not be ashamed of ourselves or our appearance. The important thing we should do is change the world mentality and fight for our ideas that show young girls can create great things based on arts, science, technology and anything else. Sometimes we have to create our imagination and sets goal so that we can prevent negative thinking of ourselves and make ourselves feel happy every day. If our young girls succeed, don’t ever give negative vibes to them because of jealousy but congratulate them. 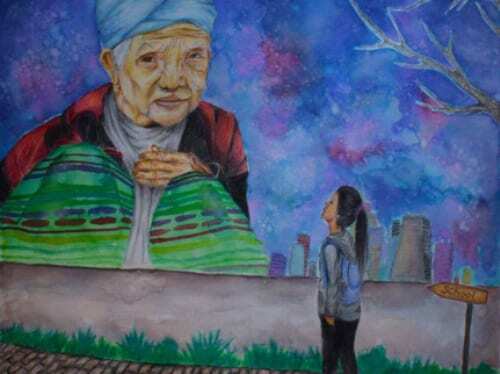 The art represents me and my grandma who influenced me in a good ways. She died in Burma, and did not come to Texas with us. She always showed us the right way, always told us to do the right thing. And she always told me to “Study hard. Behave yourself and be a good person.” She would say that not only to me but to all of my sisters and cousins. She really was a good person and kind. I really love her and that’s why I made this art piece to represent me and her. I will always remember her in my memory, because I do not have photos of her. The piece is named, Helping hand. As you can see there are two hands present in this picture. One hand represents my hand, and the other hand represents art. Like many others, I use my art as an emotional outlet. In that sense, you could say art is my helping hand. The disconnection between the fingers represent the hard times. I’m currently going through a hard time of living in poverty. Although I do not have much money, paper and pencil have always been there for me. Instead of thinking of my situation in a negative way, I choose to make it positive and create pieces about how I feel. Through this piece, I want others to find what their helping hand is (whether it’s a friend, hobby, job, etc.). There isn’t a particular who, per se, that influences me. I draw inspiration from all sorts of people and things. However, the movement that motivates me the most is pop surrealism. This art movement is so interesting and fun. It really challenges ordinary reality to create a questionable universe. Artists such as Audrey Kawasaki, Fuco Ueda, Camilla d’ Errico, etc. really makes me see the world in a different light. I want to inspire others to make their mark in the world and create their own pieces of artwork. In the future, when I become more established, I plan on opening an art academy for teenagers. There are so many talented youthful people who don’t get recognized because of their young age. As someone who has drawn all her life, I understand how it feels be the one looked over. I want to give others an opportunity to fulfill their dreams, without age being a restriction. Influence is using one’s power to impact the lives of others. I hope to influence others by improving their lives, as women in my life have done for me. 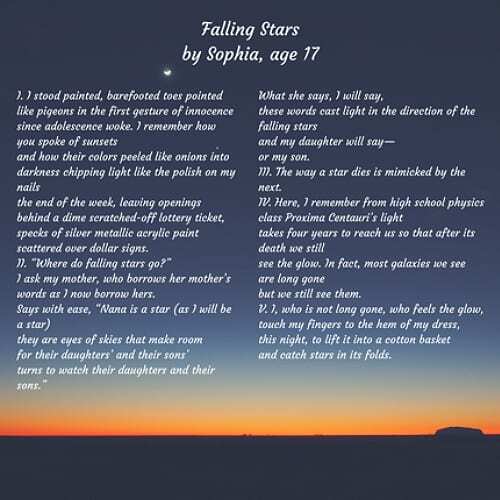 My work is a poem titled Falling Stars that shows how my family has positively influenced my life. Every little thing we do for others counts even if we do not feel or see the effects right away.